The 17th-annual Melrose Street Fair, set for March 2, has plenty of attractions and activities for the whole family, including friendly dogs (must be leashed). 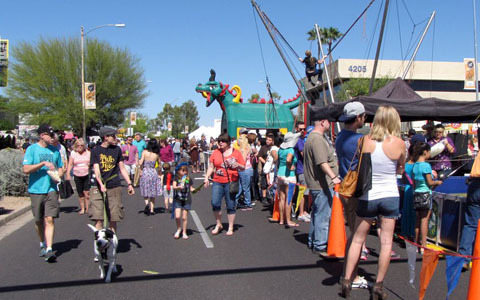 Enjoy food vendors, live music, and over 200 of local businesses and agencies “boothing” along the stretch of 7th Avenue south of Camelback Road to Indian School Road (photo by Gregg Edelman). 7th Ave., from Campbell Ave.
A free event to the public, featuring more than 200 local and independent artisans, food trucks, live music, a craft beer/margarita garden, and the ever-popular Chester’s Classic Car Show. Children will enjoy a Kids Zone with face painting, bounce houses and a video game truck. The road will be closed to pedestrian traffic only; parking available in adjacent neighborhoods, and pedicabs will be available (for a fee). Leashed, friendly pets welcome. Visit www.m7streetfair.com. Featuring a unique mixture of musical acts including bluegrass, reggae, jazz and rock, as well as local band representation. There also will be food trucks, a Kid’s Zone, vendor marketplace and beer garden, as well as live art demonstration. Tickets range from $79 for a single day (fees included) to $144 for a three-day pass. A portion of the proceeds benefits Phoenix Children’s Hospital’s Music Therapy Program. Visit https://www.m3ffest.com. Enjoy food, fun, and entertainment while exploring the history and culture of Scotland. Advanced tickets are $20 for adults, $15 for seniors/military, $4 children ages 6-12, and $36 for a family four pack (2 adults, 2 children). Visit http://phoenixscottishgames.com. Hosted by the Phoenix Blues Society and featuring several local and national blues artists, music workshops, an art project for kids, food and merchandise vendors, and more. Enter from the southeast end of the park, off Moreland Street. Admission is $30, kids 15 and younger free when accompanied by an adult. Bring chairs or blankets to sit on. Limited street parking; taking the light rail is recommended. Visit http://www.phoenixblues.org. Children will have loads of fun with free games, disc golf, and face painting. Teens will have a blast in the mobile vans with video games. Adults will be interested in the many information tables. There will be food and beverages for sale, and live music. Bring your blankets and chairs and enjoy the great outdoors. For more information, call 602-256-3130. Celebrate the Arizona Irish community by watching the parade south down 3rd Street from Sheridan, starting at 10 a.m. Follow the parade to the St. Patrick’s Day Faire at the Irish Cultural Central Center, where you will enjoy three stages of Irish entertainment. There will be food and beverages, as well as Irish crafts and merchandise, Irish Clubs, a Children’s Area, genealogy booths, beer garden, and more. Free parking in Central Arts Plaza garage with advanced purchase of Faire ticket; free shuttle available. Get tickets at https://bit.ly/2BJsE1Z. Enjoy Japanese culture, art, live music and entertainment, drinks and worldly eats. There will be a Sapporo beer garden serving a premium and craft selection of Sapporo beer, local Arizona vineyard wines and Hiro sake cocktails. The Musoan tea garden also will be open for this special occasion. Tickets are $25 in advance, $30 at the gate. Children ages 3-12 admitted for $5; 2 and younger get in for free. Visit www.japanesefriendshipgarden.org. Enjoy 13 stages of live entertainment, food and drink, and more than 200 artisan shops. Mingle with over 2,000 costumed characters, eat a giant roasted turkey leg; take part in games of chance and skill; cheer on your favorite knight during the daily jousting tournament. Advanced discount tickets available online $27/adults and $17/kids ages 5-12. Adult tickets purchased at the Festival Box Office are $1 more. Discounts tickets can be found at Fry’s Food Stores, while supplies last. No pets; free parking. Visit http://arizona.renfestinfo.com.